Sunday morning Becca summoned me (well, politely requested) to help walk the fish up Higgins to the starting point of the parade. It was propped up over a bike and trailer, which made it easier to carry. As we dragged this mostly-completed fish downtown, we got many stares and smiles, and several compliments. The fabric had been spray-painted with a shimmery turquoise, and red and yellow spots added to make it look more realistic. Upon reaching the red X's we hastily attached the dorsal fin to its support (a yard stick found lounging at the WEN office). Several interns volunteered to operate the fish, including myself, Lauren, Maizie, and Joanna, along with Becca. Becca was responsible for the gills, Lauren and Maizie held up the spine and fin, and Joanna (in the tail) moved the whole thing side to side. I got to open and close the mouth. The head did not have specific handles to hold onto, so we added a duct-tape handle onto the lower half, and covered this with Becca's stonefly wings from last year to hide it. This also had the effect of making the fish look like it was eating a bug. My other hand held onto the red tubing that served as the spine. The plan was simple. I would look through the "nose" gap and through the open mouth to follow Al, dressed up in her caddisfly case costume, as if trying to eat her. She would guide the fish down the street so we avoided hitting other parade-goers. For the most part this worked, except when the parade slowed down and I ran into her a couple times. When we could tell early on the parade was slowing, the fish did tricks. Al zigzagged across the street, with the trout chasing the tasty snack she was, and several times she led the trout in a full circle! 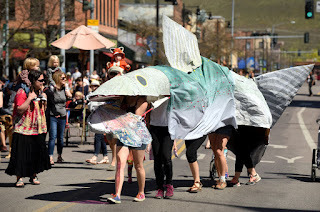 We stayed toward the back of the parade to minimize collisions and ensure we had room to make the trout truly come to life. The cardboard of the head shaded me nicely, keeping the heat and burning rays of the sun off me. Those under the fabric middle complained of the heat, as it seeped through more easily there. My arms did tire, as predicted, even with alternating which held the top of the head and which opened the mouth. At times I rested the top on my head to take some of the weight, but this made it harder to see and follow Al. Partway through the parade the hinge holding the jaw to the head dislodged, so Becca and I worked as a team to keep it together. She held the jaw in her mouth while I moved it with one hand, and when she needed a break I rested the top on my head and used both arms to move the jaw. In addition to this, the joints of the gills came apart too, but Becca held them together. Even with Frankenstein Fish falling apart at the seams, WEN folks kept it swimming! As we made our way toward Caras Park, we heard many shouts and exclamations about our fish, though we could not see who made them. "It's a shark!" adults would call, and some more generally and only slightly more accurately, "Look at the fish!" It was the children who corrected their parents, calling out, "Trout!" We were told a photographer followed us the whole way too. Our trout was a hit, and much thanks is due to all the volunteers who helped put it together (Al and Becca put in some loooong hours the day before the parade!) and carry it down Higgins for the public to see. Those of us who were inside the trout took it, slightly broken apart, back to WEN and celebrated the day with some Big Dipper ice cream afterwards. The Roxy's Wild Walk Parade came back in full swing this year, with a warm sun overhead and upbeat music leading the way! WEN got straight to work to create the best costume of this year's parade. The students dressed as water-bugs last year had commented that it would have been more fun to swim alongside a trout. First, there was a gathering of great minds at the WEN office to determine how to construct such a thing. How large should it be? Should it move? Should we carry it or wear it? What material should we make it out of? Becca was inspired by the design of Chinese dragons, with the creature carried along by several people. We would have a fish puppet of sorts, with a mouth that opened and shut, and a tail that swished side to side. The fish needed to be lightweight enough to carry, given its large size, so Becca made a trip to Home Resources, a local hardware store. She found some red plumbing tubing we would use to hold the fish's shape. "How far can I bend this? What can I use to cut it?" she asked. "You know this is for plumbing, right?" the man behind the counter replied after answering. Of course she knew, but creativity is famous for re-purposing items. Al, a long-time WEN volunteer, disassembled some cardboard boxes and we arched them between the spine and lip to give shape to the head. Becca thought it would be cool to have movable gills, so the next task was to connect tubing to the "spine" in such a way that it would move but not fall off. Our initial version used the assistance of duct tape. We did not have many hours this first day, so we ended with the basic skeleton of the trout. I came into the office later in the month and Becca told me about the costumes the kids from the Sussex and Community School were designing. Some made bug costumes like last year, and another class decided to be ducks. Becca really wanted to borrow some ducklings from local people, but... "turns out people aren't fond of you borrowing their ducks - and bringing them to a preschool." So without the visual aid, they turned paper plates into duck bills to wear on their heads. When I returned to WEN the week before the parade, a volunteer was applying a second coat of paint to the paper skin others had started previously. A volunteer named Karen showed me her process for mixing white, black, blue and green so they approximated the same color of grey that was already dried onto the paper and we tag-teamed the rest of the painting. Al arrived soon after and we tackled the problem of how to lay the skin over the fish so there wouldn't be any strange gaps. Al attached hangars and wire to the end of the tail (which had been structured while I was gone) to support the tail fin. Becca had given me keys to the basement to retrieve this tail fin, which was painted gorgeously onto paper like the rest of the skin by another volunteer named Nicole. Unfortunately, it was slightly too short! We decided to address the rest of the skin first, and deal with extending the tail fin later. Several other interns had arrived by this point, and since we could not proceed without some sort of sticky substance, one of them kindly went out to buy rubber cement for us. Al and I used the time the intern was away to cut one of the sheets of paper skin so it would most efficiently cover the fish's head, without creating oddly-shaped strips we couldn't use. One sheet perfectly covered the head when we cut and rearranged it, saving the last three for the tail. (We held up the tail and laid them over it to ensure it was enough.) The intern returned and we excitedly glued the skin down, ducking under tables to access both sides, and attaching binder clips to hold the frame and skin together while it dried. Just as I was about to leave for the afternoon, Nicole showed up, saving us the difficulty of attempting to recreate her tail design and coloration for the other side of the fin. Having her finish it kept the style consistent.